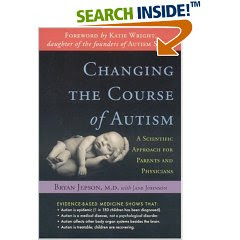 The homeopath lent me this book which outlines in fairly extensive, but not unreadable detail the medical issues behind autism. The basic premise is that autism needs to be seen as a disease, not a disability. Rather than it being an untouchable brain/neurological/psychological disorder, it is a systemic, whole-body condition which can be treated. I find books like this a lot more helpful than, for example, the book on George and Sam (see previous posts) because it outlines the problem and the possible causes and gives solutions. And boy, I like solutions.